Austrian iron ore miner VA Erzberg intends to electrify the main haul road of its Erzberg mine site and operate a fleet of T 236 trucks from 2021 under trolley assist. Liebherr is not new to trolley having eight T 284 trucks under trolley at FQM’s Sentinel copper mine in Zambia and with its large T 284 fleet at Cobre Panama set to operate under trolley in the coming years. But this deal is significant involving the much smaller T 236. 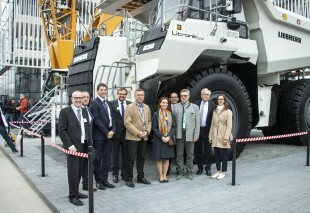 Representatives of VA Erzberg and Liebherr celebrated this new collaboration at the Liebherr booth at Bauma.